It was little over fifty four years ago that I had first introduction to Advaita Through Sri Samkara's Vivekacudamani. Since then, I have been reading the work a number of times and each reading gave me a new insight into its contents and produced a deeper understating. Of all the Prakaranagranthas of Bhagavan Sri Samkara, this stands in a class by itself for its exhaustiveness of treatment, lucidity of its style and directness of its expression. In fact, the reader feels that the Guru in this work takes him by hand and leads him step by step to the grand finale so picturesquely described in the concluding slokas. That is why the Vivekacudamani had all along a special fascination for me as for all students of Vedanta. This fascination increased a great deal when, in 1958, by a stroke of good fortune, I happened to see in the camp at Tiruchirapalli of His Holiness the present Samkaracarya of Srngagiri a printed copy of the Vivekacudamani with the Commentary in Samskrt by His Holiness Jagadguru Sri Candrasekhara Bharati Pujyapadah who adorned the Srngagiri Pitha succeeding with rare distinction that lion among ascetics, Jagadguru Sri Saccidananda Siva-Abhinava Nrsimha Bharati Mahasvaminah. In the well-chosen words of the full-throated tribute that the present Acarya tenders to him which cannot be bettered, Sri Candrasekhara Bharati Svaminah was krtatapascaryah, sarvatntrasvatantrah sastropadistarthanusthananisthagaristhah, apa-roksikrta-atmatattvah and jivanmuktah. He was both a scholar and saint of outstanding eminence. His Commentary on this work modeled on Sri Samkara's Bhasyas bears not only the impress of his deep knowledge of the source-books of Advaita Vedanta from which he quotes to give point to the Bhagavatpada's teachings, but also reveals the touchstone of his personal anubhava against which he has verified the truths that he elucidates. 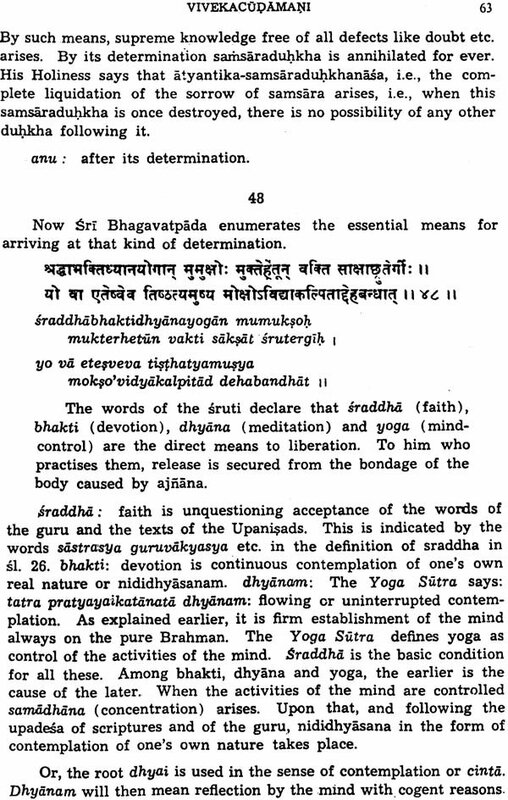 From the time that I saw the book and went through the Commentary, I conceived a strong desire to translate it into English to come into grips with it and understand it with greater intimacy and clarity, and also to make available to those who could not read the original, but are ardent votaries of Advaita Vedanta, a classical Commentary true to tradition, without diluting it to suit the so called temper of the modern times. I shall be gratified if, after going through the translation, such as it is, the reader feels an impulse to qualify for reading the original itself to catch its spirit and substance which no translation. Can ever convey. 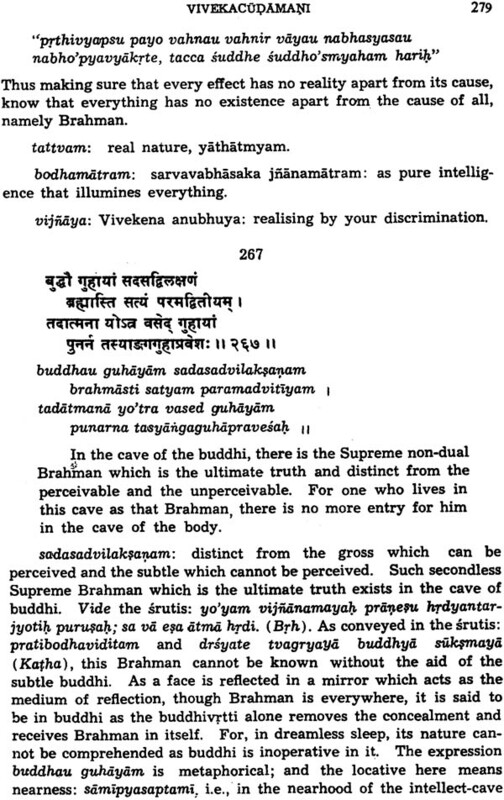 Brahmasri Bhasyabhavajna V.R. Kalyanasundara Sastrigal, at present University Grants Commission Professor of Samskrt of Samskrt in the Vivekananda College. Madras, sisya of Sastraratnakara Veppathur Vaidyanatha Sastrigal and an erudite scholar in the sastras, was good enough to assist me to make this translation. I went through the original for the best part of a year reading it with him line by line, in certain cases more than once, and verifying the translation with him. That he condescended to give his time to me in this behalf in the midst of the heavy schedule of his duties in the College and the demands on him outside, and so willingly and so cheerfully, overpowers me in my sense of unrequitable obligation to him. Dr. C. S. Venkatesvaran, Head of the Department of Samskrt in the annamalai University very kindly went through the translation, rectified the omissions and amended it in many places. I am very much beholden to him for this and for commending it to be printed and published. Two esteemed friends of mine warmly appreciated my intention to make this translation of a work by an author held in great and devout reverence by both of them. One is the late lamented Sri K. Balasubrahmanya Aiyar and the other, Sri T.V. Visvanatha Aiyar. Two esteemed friends of mine warmly appreciated my intention to make this translation of a work by an author held in great and devout reverence by both of them. one is the late lamented Sri K. Balasubrahmanaya Aiyar and the other, Sri T.V. Visvanatha Aiyar. From the time I took it up, they gave me every encouragement and counse], watched its progress with a concern which was indicative of their desire to see the accomplishment of a good and holy purpose-a concern which also bespoke their affection for me. For all of this, my debt to them is immense. My only regret is that Sri Balasubrahmanya Aiyar is not alive today; for, he would have been greatly delighted to see the translation printed and published for the very excellent reason that the name of the illustrious author of the original Commentary always evoked from him expressions of deep and spontaneous reverence. Before I close, I must place on record the very valuable assistance of my friend, Dr. M. Narasimhacari of the Samskrt Department in the Vivekananda College, Madras, in going through the proofs from the Press and correcting them with his usual thoroughness and efficiency, particularly wading through line after line re-plete with italics and diacritical marks. No words of mine are adequate to express my obligation to him. Without his help, there would have been more errors than have been listed at the end. The reader is requested to rectify them before perusing the book. It only remains for me to pray that Bhagavan Sri Samkara and the great personages bearing His haloed Name may help me through my future lives to convert this mere faltering sastrajnana of Advaita into at least a semblance of a felicitous plenitude of a realized experience. Sri Samkara, reverently adored as the Bhagavatpada belongs to the galaxy of Master-Minds of the world holding a pre-eminent place among intellectuals and prophets. He is by far the most outstanding personality of all times and of all countries. One must search long, wearily and in vain among the illustrious of every land for a seer and saint of such stature and of such achievement as he packed into his all-too-short life. During a period of intense activity which, in the thirty-two years of his sojourn on earth, omitting the years of his nonage, could not have exceeded fifteen or sixteen of them, he sanctified the soil of this ancient land by traversing its farflung corners, performing his intellectual digvijayas, and ultimately, he established himself on the throne of omniscience. His marvelous intellect has evolved out of the tripod of our scriptures a school of philosophy of great speculative daring and logical subtlety. Acknowledged as such by everyone in the east and in the west, in its thoroughness and its profundity, the system of Sri Samkara holds the first place among the philosophies of the world. Much as followers of other schools may deplore it, it is not wholly unmerited that Vedanta and Advaita are understood to be synonymous. The chronological first in the triad of the main current Vedantic interpretations is also acclaimed as the logical highest. 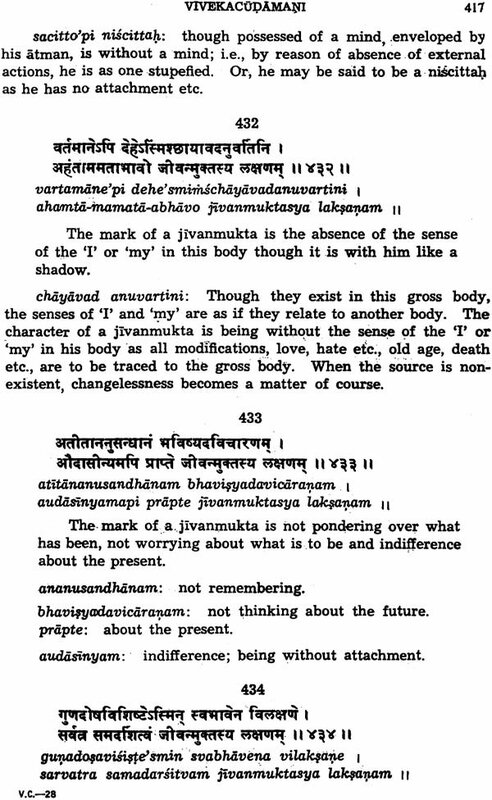 Sri Samkara was no mere dialectical metaphysician. He also prescribed a way of life which must inevitably lead to a vision in which the individual loses himself in the discovery of his true nature. Appalling as it is in its heaven-kissing grandeur, relentless in its incisive logic, and forbidding in its austere absoluteness, Advait Vedanta has been the despair of minds made out of common clay. But, we have the authority of the illustrious line of his disciples that to a wise and initiated mind instinct with faith and understanding, governed by discipline and held by devotion, Sri Samkara's system, grounded on sastra, guided by yukti, and confirmed by anubhava, in its design and in its execution, has an artistic merit all its own which compels conviction and invites acceptance. Its numerous followers since his time have borne testimony to the validity and value of his teachings and, even in our day, we see amidst us walking verifications of the verities that he preached. It is our firm belief accepted from tradition that he was no ordinary mortal. It is the habit of the Indian mind to worship whatever is excellent in the world as of divine essence. yadyad vibhutimatsattvam srimad urjitameva va ! tattadevavagaccha tvam mama tejo'msasambhavam !! If Siva, whom we adore as Daksinamurti is the eternal Teacher of all the words seated in supreme silence under the ageless banyan tree, Sri Samkara is the dynamic edition of that static splendour who walked abroad delighting in the sustenance of his vadabhiksa speaking words of Vedantic wisdom, to rescue erring mortals from the tormenting fires of life in this vale of tears. The eternal Sambhu became the historical Samkara. In the realm of religion, Sri Samkara is a great revivalist, hailed as sanmatasthapanacarya, who re-established the six ways of worship of the Godhead, purifying them of excrescences that had gathered round them. In the process, he also established the non-difference between Siva and Visnu with his cardinal principle of abheda in the sects of our religion. By this, he taught the universality of the Vedic religion and successfully rid it of the contradictions of its partisan adherents of different schools. He also synthesized the triple way of karma, bhakti and jnana assigning to each its proper and necessary place in the unitary method of achieving liberation from the ills of samsara. All these stemmed from the philosophy of Advaita which he taught as the central truth of the Upanisads, the Brahmasutras, and the Bhagavad Gita known as prasthanatraya of Indian Philosophy. He expounded this at length lucidly and cogently in a language characterized as prasannagambhira in his commentaries on all three of them. That they have been surviving in the thoughts and utterances of men during the centuries that have elapsed since he wrote and that they have secured understanding appreciation even from people of alien faiths in lands far removed from ours is eloquent vindication of their truth and vitality. The study of these prasthanatraya-bhasyas requires profound knowledge of Samskrt and proficiency in Vyakarana, Nyaya and Mimamsa and in Veda-adhyayana. A long line of scholars thus qualified have taken to the study of the bhasyas which they have been transmitting down the centuries to their sisyas similarly qualified. 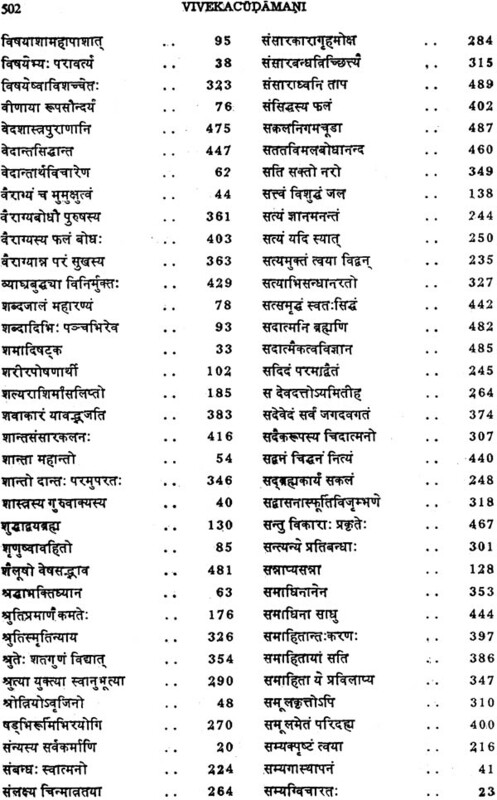 This line of scholarship is being kept alive to this day in all parts of our county in guru-sisya relation which is characteristic of Indian tradition in the Mathas that Sri Samkara established or sprang up under his auspices or in his name and in the private residences of Vedic and Vedantic scholars. But Sri Bhagavatpada realized that not all will be thus qualified. 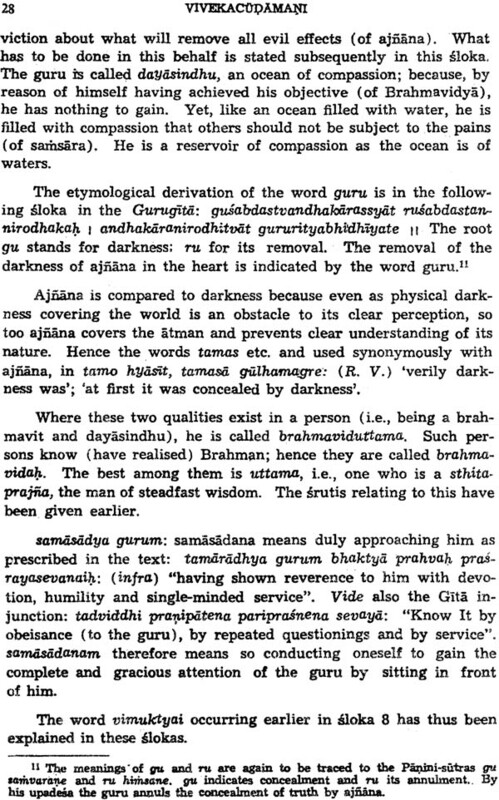 Intending to instruct such persons in the truth of Advaita Vedanta, he wrote what are called prakarana-granthas in verse and prose varying from a single sloka to a thousand. The more important among these are the Satasloki, Sarva Vedanta Sara Sangraha, the Upadesa Sahasri and the Vivekacudamani. The first is a work of a hundred verses, the second of a thousand verses, the third a mixture of prose and verse, and the last a work of five hundred and eighty-one verses-all conveying the quintessence of Advaita Vedanta. 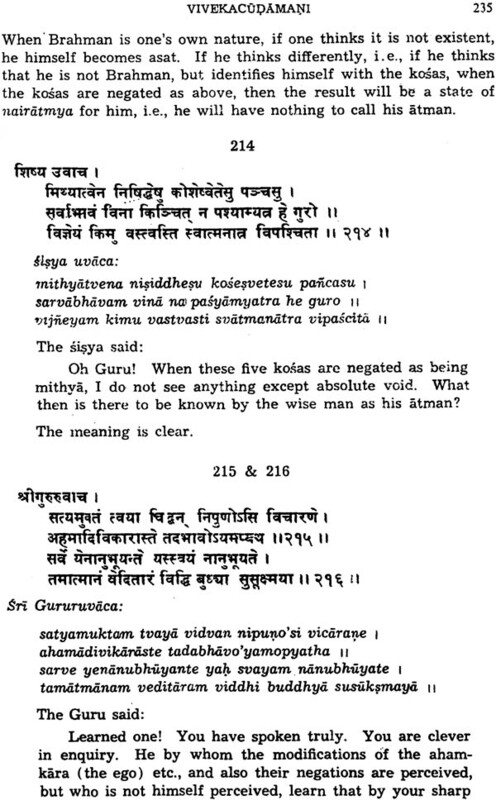 The last which is appropriately called "The Crest Jewel of Discrimination" contains in its 581 slokas a dialogue between the Guru and the sisya, expounding the Advaitic truths and culminating in the ecstatic experience of the sisya of his non-difference from Brahman and the realization of his mukti. Alike by the nature of its contents and the easy language of the slokas, the Vivekacudamani has been justly popular among students of Advaita. Sri Samkara, reverentially adored as Sri Bhagavatpada, wrote illuminating Commentaries on the triple classics of Vedanta Philosophy, the Upanisads, the Bhagavad Gita and the Brahma Sutras to provide knowledge of the scriptural texts, reinforcing them by accordant reasoning and verifying them by personal experience. 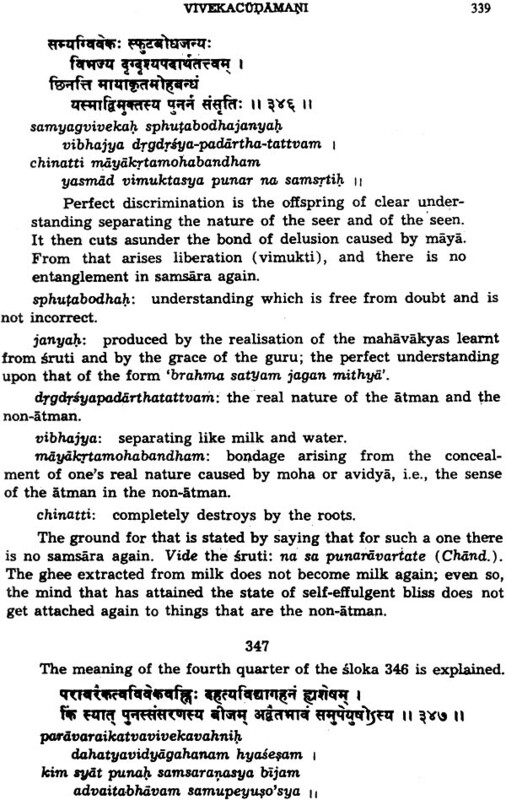 Out of compassion for those who are incapable of mastering these commentaries and to instruct them in the verities of Vedanta, he wrote a number of minor works known as Prakarana Granthas. Of these, the Vivekacudamani is the best known. It gives the quintessence of spiritual knowledge. Significantly called 'the Crest Jewel of Discrimination', it shows that the ills of life are to be traced to one's inability to discriminate between the eternal and the ephemeral. 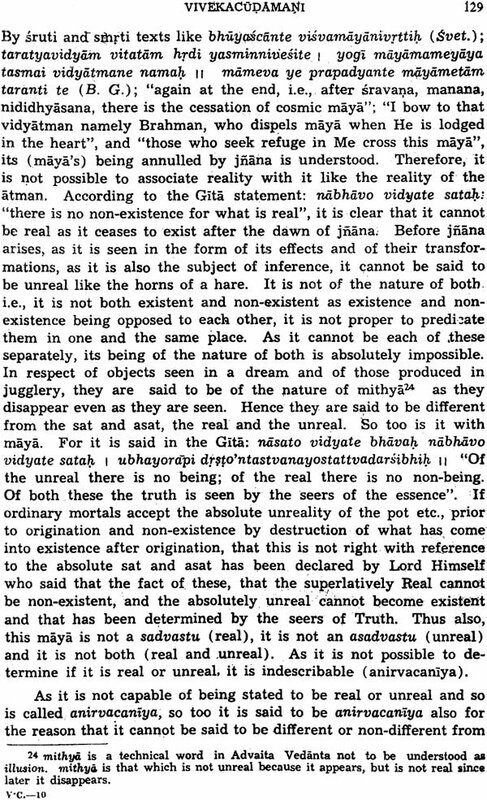 Mistaking the worldly things which are the non-atman for one's real atman, one loses oneself in pursuit of them, and thus prolongs the samsaric cycle. 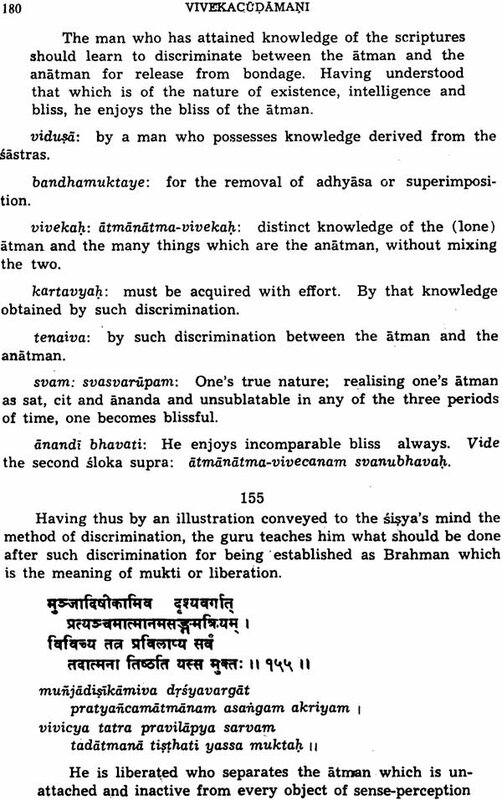 Discrimination between the atman and the anatman is the primordium on which the entire spiritual process for atmasaksatkara which leads to liberation is based. Sri Bhagavatpada charts out this voyage of an afflicted and earnest inquirer across the sea of samsara in the form of a dialogue between a sisya and his Guru to whom he has supplicated, and who helps to transmute the textual knowledge of the sisya into a fact of realization. There was no extant commentary on this work for long. This has now been graciously provided by the celebrated Jivanmukta, His Holiness Jagadguru Sri Candrasekhara Bharati Pujyapadah of revered memory who adorned the Sarada Pitha at Srngeri as its thirty-fourth pontiff, on the lines of Sri Bhagavatpada's Bhasyas on the Prasthanatraya, endowing the golden petals of this classic with fragrance of his masterly exposition. This book is an English rendering of this Commentary by a feeble pen which is conscious of its limitations to bring out the spirit of the original with fidelity to content an accuracy of expression. "By itself this atma is of the nature of Brahman which is Cit, Sat and Ananda (Intelligence, Existence and Bliss) and without a second. But, it has strayed from its native non-dual Brahmanhood compacted of cit, sat and ananda by the operation of avidya (nescience) which has its locus init, which pertains to it, which is known by its own experience and is accompanied by its reflection. By the sense of the atman imposed on whatever is not the atman like the body etc. a person fails to secure in their entirety the approved objectives of human endeavour (purusarthas) and becomes a victim to all kinds of evil. By the means tainted by avidya and karma, he yearns to get his heart's desires and to avoid those that he dislikes. He is not able to achieve the supreme purusartha of liberation (moksa) despite his observance of the instruments, secular and sastraic. He is drawn hither and thither by attachment and aversion as by crocodiles etc. Subject to the transmigratory process, and being born out of different wombs in varied forms, as celestial, human and animal, and overcome by delusion, yet, somehow, by the operation of the merit of his good deeds, he performs, actions prescribed in the Vedas in a spirit of dedication to God. Then, all the impurities of his mind are removed. He cultivates detachment from the enjoyment of the fruits of actions here and yonder. He is eager to understand the nature of Brahman proclaimed in the Vedanta texts. To that end, he acquires the qualificational means like sama, dama (sense-control and mind-control) etc., and humbly approaches an acarya who has realized Brahman. Conforming to his instruction, and by attentively listening etc. 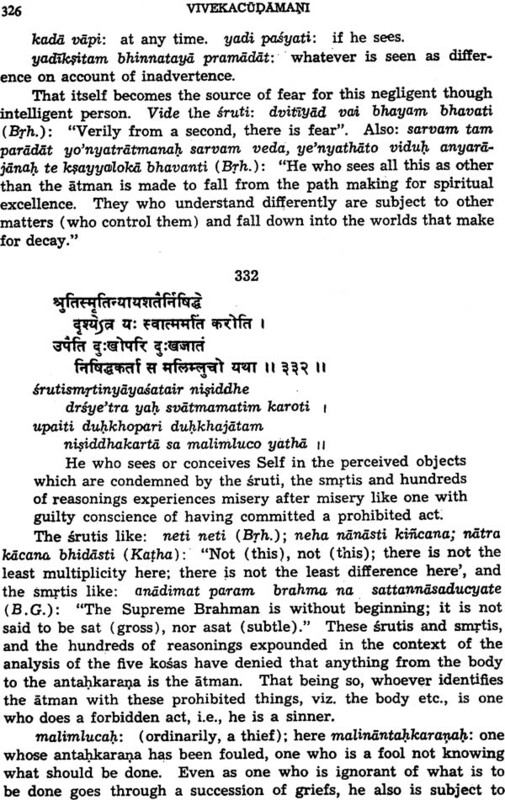 to the sruti passages, he comes to understand the truth expressed in the statement, "I am Brahman." Then all his ajnana is destroyed with its effects and he remains firmly established as Brahman. This is the ultimate goal of all Vedanta."